One of the Maldives’ newest boutique resorts, Fushifaru Maldives, located on the far North East border of Faadhippolhu Atoll, more popularly known as Lhaviyani Atoll, made waves with a first-of-its-kind arrival ritual by welcoming all guests to the island with the blowing of the Sangu or Sea Conch (a significant aspect of Maldivian cultural history, the Sangu was traditionally used by village elders to call the community to attention for important announcements), thus marking the first of a collection of indigenous Maldivian experiences available at the resort. For guests looking to channel their inner Robinson Crusoe, learn to climb a Coconut Tree at our Coconut Tree Climbing Masterclass – a solid 99 minutes of laughter-filled bonding with one of the many beautiful coconut trees on the island, all supervised by an experienced member of our recreation team. Learning to scale the smooth, sturdy trunk barefoot or with a piece of strong cloth gives beginners a great sense of accomplishment, not to mention fantastic photos! Climbing trees is a staple skill amongst the islanders to gather coconuts and palm fronds for making everything from twine and baskets to mats and fans and to harvest fruits, leaves and spices that typify traditional Maldivian cuisine. Guests will also get to see the fruits of their labour, taking home their very own island-made mats and baskets. 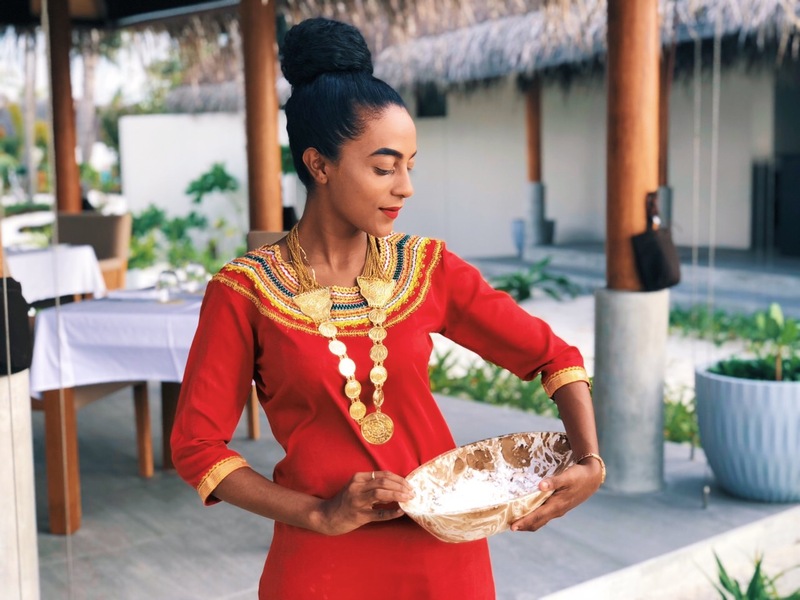 Guests are also invited to experience other interactive activities, from toddy tapping and milking of coconuts to the making of pure coconut oil. 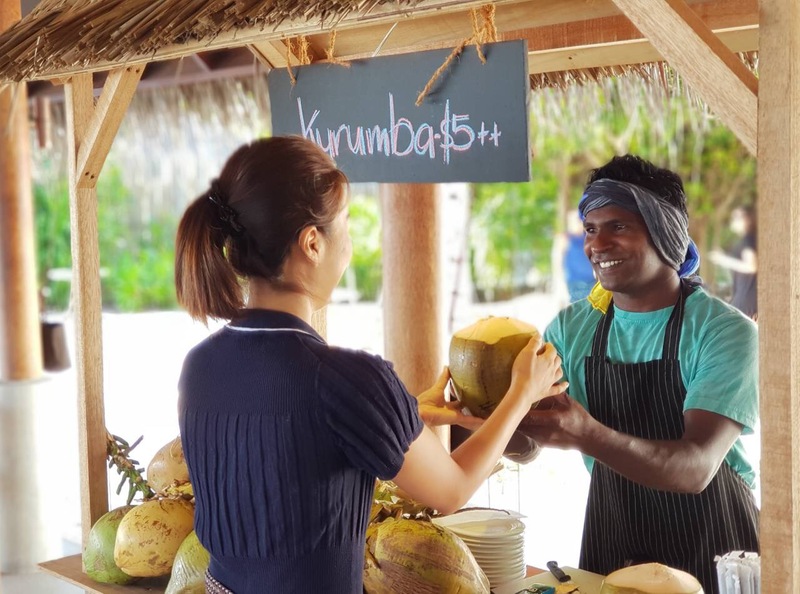 They can also try their hand at weaving traditional Maldivian rope using the coir of dried coconut husks, as well as Cadjan weaving using dried coconut leaves – essentially making the roofs over their villas! 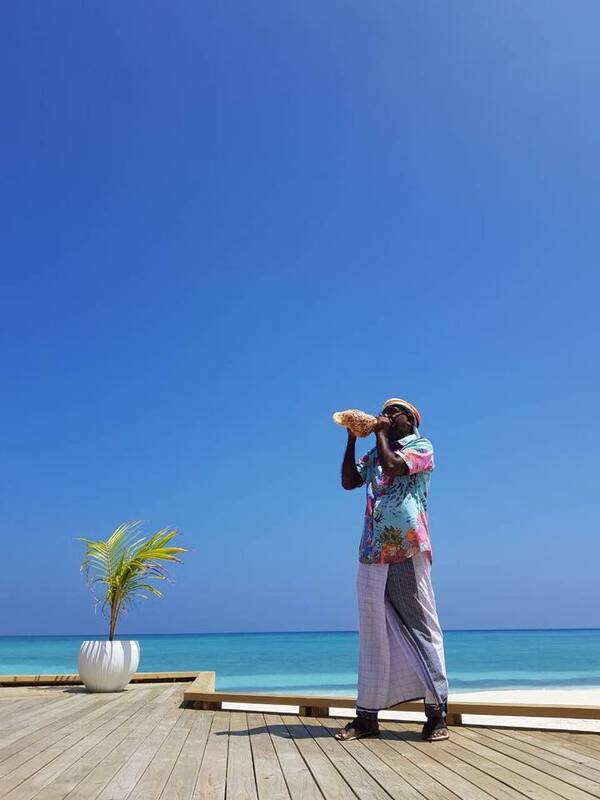 For guests who are more musically inclined, Fushifaru’s Boduberu Beat session gives them a chance to try their hand at playing the boduberu drum made traditionally from the trunk of the coconut tree. This traditional Maldivian instrument bears influence from the music in East and Southwest Africa that was brought to the islands by sailors from the Indian Ocean around the 11th century. Starting first with steady rhythms before gaining tempo and reaching a loud, festive and exhilarating crescendo that is referred to as “vibrating the island”, the session also features dancers who will accompany guests by jumping, swaying and singing along to the music. The interactive, energetic nature of Boduberu Beat makes for a great workout and an immersive Maldivian music experience for all ages. For gastronomes and those curious about the culinary arts of the local islands, the resort offers a hands-on Maldivian Cooking Class on Maldivian Tuna Curry, Mashuni – a staple Maldivian salad of tuna flakes, chopped onions, tomatoes, chilli and a sprinkle of lime, accompanied by steaming hot Roshi – Maldivian flatbread. A conservationist’s favourite, guests will be guided by the resort’s Resident Explorer to discover and learn about the diverse flora and fauna that make this exquisite little island a wonder both above and below the waterline. This includes spotting the island’s two Resident rabbits! Occasionally, guests may even be treated to a mother turtle laying her eggs right outside a villa. 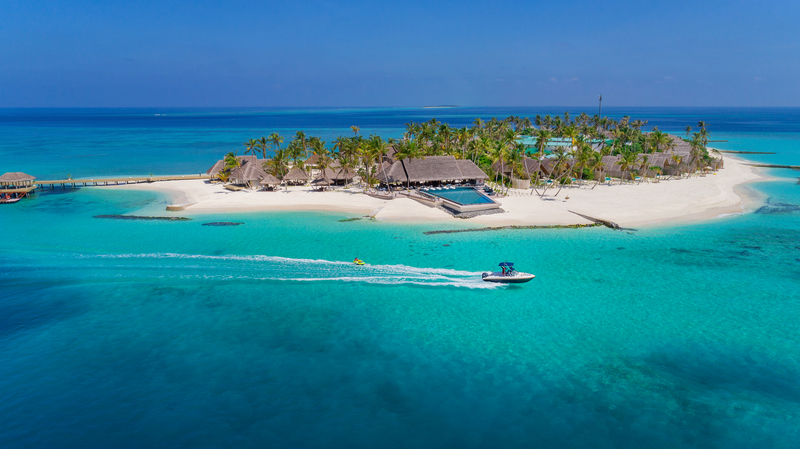 As custodians of conservation, each guest is encouraged to contribute in any small way to saving the planet, all whilst enjoying the wonders of idyllic island life. Kaashi – coconut meat often accompanied with dried tuna, Theluli Bambukeyo – breadfruit chips usually served at a housewarming, and Laagulha – Molucca bean which is also used as traditional medicine. 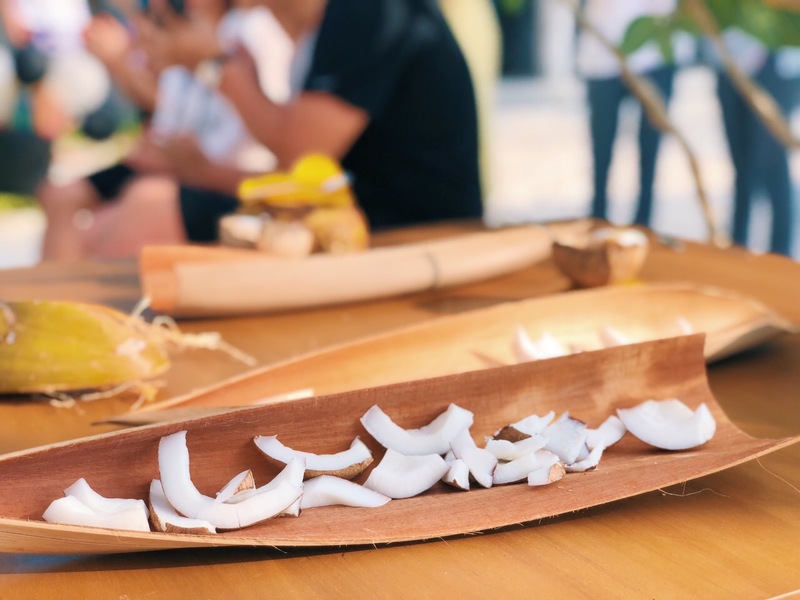 Not forgetting our Very Important Kids, children will also receive traditional toys including Madhoshi – red sandalwood seeds usually collected by local island children to play games with, and Boli – cowrie shells that were used as the first form of currency in the Maldives. Merging quintessential Maldivian design with modern aesthetics in its 49 beach and water villas; Fushifaru Maldives is an ideal escape for adventurers, conservationists and traditionalists. For reservations and enquiries, kindly email Reservations at [email protected] or visit www.fushifaru.com. Alternatively, follow us on Facebook Instagram and Twitter for daily updates.